The saffron in this cake gives it a delicious flavour and pretty golden colour when sliced. Look out for the November recipe card for icing the cake. Place the apricots, sultanas, rum and saffron in a bowl, cover and set aside for several hours or overnight. Stir in the almonds, cherries, tropical medley, peel and rind. Preheat the oven to 170°C, gas mark 3. In a separate bowl, whisk the butter and sugar until pale and fluffy. Beat in the eggs, one at a time. Sift the flour and salt and fold in, followed by the ground almonds, ginger and fruit mixture. Spoon the mixture into a greased and lined 20cm square cake tin. Bake for 1 hour then lower the temperature to 150°C, gas mark 2 and cook for a further 1 hour until the cake is firm to the touch and has slightly shrunk away from the sides. 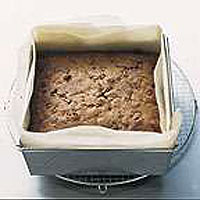 Leave the cake in the tin until completely cool, then wrap it in greaseproof paper and store in an airtight container. This recipe was first published in October 2000.